Meeting held on Wednesday 24 April at the Museum of Hunting and Nature, and on Thursday 25 April at the head office of the French canine organisation (SCC). These two days devoted to the selective breeding and well-being of the canine race, have returned the canine organisation to its position at the centre of the dog breeding world. This meeting aimed to be an intermediate step linking the 1st International Workshop on Canine Health organised by the Swedish Kennel Club (SKK) in Stockholm in 2012, and the one to be arranged by the German canine organisation (VDH) in 2014. 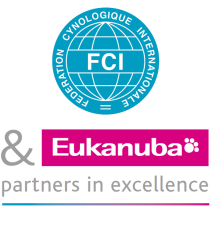 It brought together some of the European canine organisations most involved in canine health and well-being, from Germany, Belgium, Italy, the United Kingdom, Sweden and Russia, as well as representatives of the FCI and the sponsor Eukanuba, in order to discuss setting up common platforms regarding health and genomics. The committee of the French canine organisation and their Scientific and Technical Council were also present at these two interesting and ambitious days. Early in the afternoon of Wednesday, 24 April, the participants arrived at the Museum of Hunting and Nature, housed in two private mansions in the heart of the historic Marais quarter of Paris. It was thanks to the François Sommer Foundation that the first day could take place in this unique museum. Christian Eymar-Dauphin, president of the SCC, said: “The discussion was friendly and constructive, a real meeting of minds between the two workshops on the subject of canine health. The members of the French canine organisation committee and the staff who attended revealed the interest that the entire society takes in these two days.” He added: “After hiding for a long time behind our own convictions, the SCC wishes once again to participate actively in the united efforts of dog breeders everywhere to improve the health and well-being of dogs.” A position which was warmly welcomed by the other delegates, in particular, the heads of the national canine organisations. They were delighted by the French initiative, which signified its return to the centre among the major dog-breeding nations. The colloquium was opened by Dr Grégoire Leroy of the combined research unit of the French National Institute for Agronomic Research and AgroParis Tech, in Animal Genetics and Integrated Biology, and Dr Catherine André of the Institute of Genetics and Development of Rennes and the National Centre for Scientific Research (CNRS), University of Rennes 1. The main subject of their presentation: canine genetics, with its components, genetic fingerprinting, research into interesting genes and the management of biomolecular resources. After presenting the breeders’ selection criteria - the pedigree remaining an important tool - Dr Grégoire Leroy, technical coordinator for the two days, very appropriately reminded us that the canine species, with almost 600 hereditary diseases, was the most documented species in this respect, after Man. The canine species includes more than 400 breeds and represents a wide group of genetic isolates, in which all the dogs of one breed present the same phenotype and almost the same genotype. The history of each breed has led to the selection of a specific allele to fit certain specific criteria, such as behaviour traits or morphology, but at the same time this practice has also led to the co-selection and concentration of undesirable alleles, leading to the appearance of hereditary illnesses in almost all breeds of dogs. Simple genetic flaws such as ichthyosis in Golden Retrievers have permitted the evolution towards more complex illnesses, such as melanomas in several breeds. In the case of ichthyosis, the genetic basis has recently been demonstrated and this approach has also led to the development of a detailed genetic test. This work has led to the identification of an ichthyosis gene in dogs along with a mutation which causes the condition. Similar mutations have also been identified in human patients affected by the same form of the disease. Other genetic illnesses in dogs are currently being analysed using the same methodology and will be exposed. Dr Catherine André then spoke on applied canine genetics, both as a way of aiding dog breeders, but also to serve as a model for Man. But we have to stand back, because the number of genetic tests developed and available means inevitably that choices will have to be made and priorities set. The frequency of illnesses will be an important parameter in making this choice. For the last 20 years, she has been involved in developing a group dedicated to dogs, at the CNRS in Rennes. However, genetic testing will never replace clinical examination. Within the same breed, the comparison of tags from healthy dogs with those from affected animals is fundamental to research in cancerology, dermatology, as well as anomalies in development. The 3rd contribution, by Stéphane Barbier of UNCEIA, brought us from dogs to cattle. UNCEIA places a network of services at the disposal of animal genetics. In the case of cows, more than one gestation in two results from artificial insemination. But beyond this species, UNCEIA is a professional organisation of breeders representing all types of insemination - relating to cows, goats, sheep and pigs. The objective of his talk was to present to us the implication of genomics in the selection of French cattle in order to offer breeders a sustainable future. The principle rests on the comparison of DNA sequences from large numbers of individual animals belonging not only to the same species, but the same breed. The count of observed mutations will be done by the use of specific tags. With these markers it becomes possible to make predictions concerning the value of these new, selected generations - the descendants of the population of selected breed animals - and to give them a “genetic rating”. Predictive genetics have just arrived. Genomics has revolutionised the selection of cattle in the countries taking part in the project - Spain, Germany, France and Belgium. Stéphane Barbier presented the work of Dr André Eggen, who was unable to attend. The latter works for the Biotechnology company Illumina, which has built its reputation and skill by designing equipment capable of totally decoding the human genome. From Man to animal, is only one small step. The goal of genetic testing is to put in place a reliable attack programme, without frontiers, with a common screening methodology for the principal genetic illnesses observed in dogs. The route to improved health and well-being must necessarily lie in these checks and in seeking out healthy animals that do not carry the affected genes, in order to ensure that improvements in breeding stock are real and quantifiable. Experienced pioneers of modern dog breeding, the English Kennel Club, then took the stand. Aimée Llewellyn presented a report on the progress of her English colleagues with regard to breeding and health, and the use of new resources, in particular managing the collection of information. Selection for health with an introduction to modern health resources was the basis of her presentation. The Kennel Club has put in place a tool kit, Mate Select, which aims to promote responsible breeding practices, with quantitative and qualitative information aimed at reducing and eliminating hereditary diseases, while encouraging genetic diversity. The key word for those in charge of this programme is clear: encourage education and the co-operation of all interested parties - from people buying puppies to veterinary surgeons, since this is the way to improve canine health. The final presentation of the first day was given by Dr Sofia Malm of the Swedish Kennel Club (SKK). Sweden, like other Scandinavian countries, is very involved in managing data bases, in order to provide breeders with as much information as possible on the sires they are planning to use. The development of international exchanges at dog breeder level, explains that the lines intersect in the same breed raised in different countries. This is why SKK supports the creation of an international organisation, on the model of Interbull or Interbeef, which could be called Interdog. The objective is clear: to increase the number of ‘certified’ breed animals on an international level in order to improve the general health of the breeding stock, but also to reduce the consanguinity observed in some populations where the number of breeding animals used is low. After the Hunting Museum the previous day, the meeting resumed on Thursday 25 April, at the head office of the French Kennel Club, at Aubervilliers. Bill Lambert, Head of the Department of Health and Breeding at the UK Kennel Club, spoke about the innovations at the KC to ensure the promotion and well-being of pedigree dogs in the UK. He spoke of the huge impact of Crufts, which attracts over 150,000 visitors every year, with an audience for the television broadcast estimated at over 4 million viewers. The Kennel Club looks after everything to do with dogs. The Internet has acquired a defining role for the various sections of the Kennel Club. Every month, more than 350,000 searches for puppies are made on the site (“Find your puppy”) with a mini guide to download. The revision of standards with a view to avoiding all exaggeration and improve the health and well-being of pedigree dogs has involved many people in the Kennel Club. The Club has developed a whole series of tools available on their website: the information centre on dog breeds, the “Find a Puppy” tool, how to become a member, many and varied information guides available to the general public, etc. The next presentation was given by Professor Hedhammar, regarding the 1st Workshop on Genetic Improvements in Canine Health, which took place on 2-3 June 2012 in Stockholm. The main objective of this conference was to offer the participants an opportunity to exchange views and personal experiences, for their mutual enrichment. The speaker, Åke Hedhammar, is a professor in the University of Agricultural Sciences. He heads a committee composed of highly skilled specialists in genetics, dog breeding and methods of combating hereditary diseases. Around 15 countries, and the leaders of the FCI, were present at this workshop. Including veterinary surgeons, scientists, representatives of national organisations, 135 participants from 24 countries took part. Before they arrived, the material and references linked to the presentations to the workshop were available on line. A dedicated site www.doghealthworkshop.com gave access to all the information available on the various talks. A multidisciplinary group to ensure liaison between member countries and the enrichment of collaborative databases is definitely the best way forward in this area. Dr Grégoire Leroy and Dr Philippe Mimouni of the Centre de reproduction des Carnivores du Sud-Ouest, followed with a lively talk on a topical subject: What is the future of canine research? Dogs remain a model for genomics and the study of behaviour, although some people think that they are less important than some other species - cattle, sheep, etc. If the world population of dogs can be considered to be 400 million animals, less than 10% of them can be considered as “pure bred.” At the same time, never has the health of dogs been subject to so many articles, colloquia and various works on an international scale. This shows that the subject provides endless riches. Breeder exchanges have increased significantly over the past ten years, because, at the end of the day, breeding methods are similar. If genomics are an important tool, they are not the only one. Clinical diagnosis and assessment of the phenotype will continue to be essential. In the fairly near future, research will be based on information - opening up collaborative databases, publishing research results - the dissemination of the latter, with the internet as a crucial tool, and the evaluation and analysis of this information. The final talk of the day on 25 April was given by the President of the German canine organisation (VDH), Professor Dr Peter Friedrich. In 2014, the town of Dusseldorf will host the next International Workshop. The different types of diseases and malformations observed, lack of exercise, inappropriate behaviour (with people or other dogs) must influence the decisions of judges at dog shows, but this only affects a tiny minority of the canine population in question. The diminution of genetic diversity and predisposition to certain diseases must be taken into account. Finally, despite our observations, why is progress not more significant, or why are we moving so slowly? Probably, because the diagnosis often comes late, when the dog is already at an advanced age. The polygenic mode of certain illnesses makes the fight for eradication more complicated. Unexpected genetic mutations occur regularly. Which race should serve as a model for the others? Ensure there is significant funding to permit us to move forward.